I think it’s telling that the thing that makes me happiest about this outfit is the oatmeal-linen shirt, a piece made bespoke by D’Avino. I’ve been doing this for a while - trying to combine pieces of classic menswear in ways that I find pleasing - and it’s not hard to do the basics. A dark-blue jacket with grey trousers is as classic as it comes. A brown shoe with those trousers equally so. It is the details, therefore, and I tend to find subtlety of texture more enjoyable than subtlety of pattern. So the double-breasted jacket from Cifonelli pleases me because it is in a soft but heavy Japanese denim, rather than wool or cashmere. However, that pleased me most the first time I wore it, which was here. I am rather impatient for someone into bespoke tailoring, and I constantly seek a new combination, a new idea. Hence the happiness in the linen shirt, which is not blue, white or white/blue, but a natural, earthy, undyed-feeling oatmeal. It is still pale enough to have enough contrast with the jacket and trouser, but softens the whole, adds character, and is suggestive of something vintage and worn-in. The shot was part of a series for Parisian tailor Cifonelli, and it was a nice coincidence that the simple-but-striking backdrop we chose (the colonnade of London’s Institute of Contemporary Arts) reflected the tone of the shirt. That Cifonelli denim jacket is getting quite a lot of wear. The trousers it can go with are quite limiting (as discussed in the initial post here) but otherwise it’s almost as versatile as a navy blazer and far more unusual. The denim is also wearing pleasingly, with the cuffs, label tips and front edge all fraying and whitening slightly. It’s one of the key attractions of denim, and nice to see it happening here. The loafers are dark-oak antique Belgravias from Edward Green, which are unusual in that I rarely wear tassels. However, I do find that they can be a nice additional detail in an outfit that is otherwise quite plain, like this one. And the handkerchief is a navy wool/silk mix from Drake’s, with a white motif and pale-yellow border. A dark handkerchief can be a nice way to anchor an outfit - a metaphor I’ve always liked and first used back in 2009 (though the images seem to have gone missing from that post for some reason). It becomes a little more dramatic when it is puffed a little out of the pocket like this, though that is largely enforced by the cut of a Cifonelli DB lapel, which reduces the visible breast pocket to perhaps 25% of its actual width. You can follow the discussion on Unexpected texture and colour – Denim and linen by entering your email address in the box below. You will then receive an email every time a new comment is added. These will also contain a link to a page where you can stop the alerts, and remove all of your related data from the site. The denim DB blazer is a bit of a faux pad that doesn’t sit well in smart casual nor streetwear. 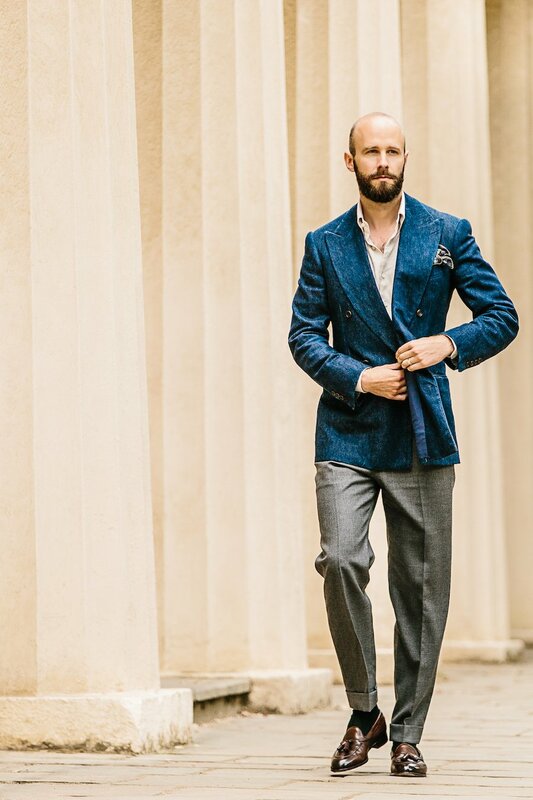 Single breasted linen in blazers is the most acceptable cut for an informal fabric. That is a great combination, and as you rightly say, the shirt contrasts nicely with the jacket. It doesn’t contrast well however (I think) with the skin. As much as I love the idea of having a new basic shirt color to work with, I don’t think it works with this kind of complexion, makes the face look washed out. With a tan, this would work great, but that is true for a lot of other colors, too. I know what you mean, and I agree it certainly doesn’t work as well as say a blue. I don’t think it’s binary though – I’d say it doesn’t work as well with my skin, but works OK.
Lovely outfit. What trousers are they? A bit of a hodge podge of stuff that just doesn’t work in my view. I’ve never been a fan of the jacket (or suit), think the trouser is fine, and like the shirt as a single piece, but putting them together is not a good look. Would you mind sharing the swatch # of the trouser fabric? This must the third or fourth pair of Whitcomb trousers I’ve noticed you wear lately recently! Are these all the “foreign bespoke” and what kind of price bracket do they tend to fall into? 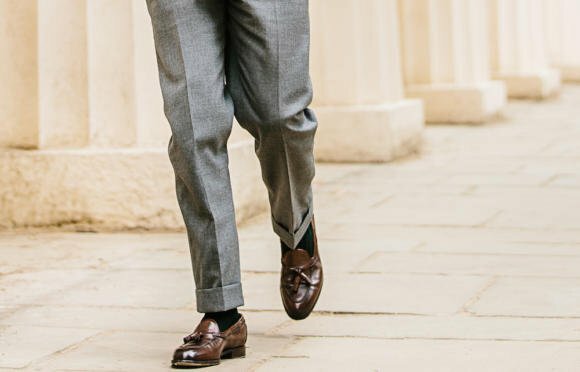 I know you’ve covered a full suit before, but if they are in the same range as Cerrato might be worth a post in their own right to nudge people looking for a Savile Row trouser alternative at a similar price point. Do you find that Crispaire bunches up because of static when worn with OTC wool socks? How do you prevent/correct it? No, not more than other cloths. If not wool socks then what type do you normally wear? Simon, The denim jacket looks fantastic, may I know the manufacturer of the fabric and the bunch and swatch number. You can find more detail on the jacket here. The cloth is not available as cut lengths to tailors generally – it is length Cifonelli sourced themselves from a Japanese supplier. Sorry, Simon – while the denim blazer is beautifully cut it’s a bit too fashionista for my taste. I’ve often found it helpful to tone Lorenzo’s stylistic flourishes, and this is a good case in point. As an aside, any reason why you’ve never opted for their signature 6×1 DB? – I have a couple and love the distinctiveness of the cut. I generally agree, for example my greed tweed jacket from them had several of the suede additions and flaps taken off. This is pretty plain other than the cloth. What is your opinion of linen-cotton blends for summer shirts? Very interesting, inventive combination. I think part of the value of a well-written, well-researched site like this lies in being exposed to ideas that one might not have perceived as obvious. Including details such as the addition of a slightly dandyfied, ornate touch, like tassel loafers, in a context where some of the elements have been rendered more casual due to texture / colour choices. As a clothing reactionary, I feel that it is far from often that one sees innovation done this well. Possibly a silly question, but I’m going to ask it anyway… given that jacket is made from denim, is it machine washable? What exact color are the trousers? There’s a bronze/brown tinge to them in the first picture, which makes the combination look even better (in my opinion). Simon, it just dawned on me that I haven’t seen you in glasses in a while. Are you wearing contacts now? Interesting post; although it’s not for me, the coat looks great. I’ve always worn contacts – whenever I’m doing sport or cycling to work essentially. But yes you’re right, I wear contacts more often now. I knew the jacket reminded me of a jacket I’d seen elsewhere. Bing Crosby had a similar jacket. If you type denim tuxedo Bing Crosby in google you’ll see a similar jacket. Simon, was Bing your inspiration? No, and that’s rather different – with the contrast lapels, buttons, and being a suit. My compliments for pushing the conservative boundaries some of your readers’ aesthetics. That jacket is Ford with well upgraded craftsmanship. I know this light blue is particularly popular with the Italian crowd (bien que Cif soit français), but I would have gone with a darker, closer-to-raw-denim shade to be worn with light trousers as opposed to the up-and-down medium-valued outfits this jacket confines you to. Would’ve been more striking I fancy. My two cents – the trouser / socks / shoes shot is wonderful, not least because the weight and color of the trousers (and the sturdy cuff) sit nicely above the shoes in their hues of brown. I understand the furore in the comments above over the denim db, but what’s life without a little fun! The shirt colour doesn’t suit Simon or the jacket and the whole thing looks too contrived . That said, although I’m not a huge Cifonelli fan (too Dandy ) there is something worthwhile about this jacket but I think Simon is yet to discover how to wear it. Its texture, the way it is ageing and the way Simon defused Cifonelli’s excesses with the cut make it interesting but perhaps it’s just all too complicated ? Certainly not the sort of outfit you could throw on in the morning and forget about and that says something. Probably this makes it the antithesis of true ‘Permanent Style’. On a point of detail, personally I can’t stand tasseled loafers. I understand the idea but don’t think it works. The balance in weight is wrong; think seersucker with flannel. The coat is very bulky and everything else very fine (nothing to do with weight) so it looks more like outerwear. I don’t see the colours working well together. Top and bottom look a bit muddy, whilst the shirt looks washed out against both. And the shoes are too formal for the outfit with their patinage. Suede or perhaps nubuck would be better. On a personal note, how does feedback make you view your clothes? I wouldn’t believe you if you said you were completely immune from the criticism (or positive reinforcement) that the comments on this website must give you. Does it affect your confidence ever, or change the way you approach / view something? To be honest, it doesn’t often change my view. I really like having the views of others as comments, particularly as it gives a more rounded view for readers (my view is just one view). But it doesn’t often make me think differently – probably because I have spent so much time myself thinking through all the options, and trying most of them out. However, in 10 comments there is often one that does make me look at it differently – here, that was the reference to skin colour and the linen shirt. It made me formulate my views there a little differently, and conclude that there is a scale of complimentary colours to the skin, which you should take into account just as you consider scales of formality or originality. I would still wear the shirt in the same way again, but I would be more aware of this balance. Separately, it definitely makes a difference when people are complimentary! I really wish it didn’t, but it does…. Hello Simon. For what it’s worth I think the shirt looks first rate . We all (probably all) try a different mix of clothes each day, We vary/experiment/have fun with our clothes. That’s what it’s about and what we all enjoy. I think?.. Simon: one suggestion – I’ve noticed you often (always?) wear your casual button downs with the top two buttons undone. I’ve often opted to do the same (particularly with more casual outfits and in the summer), but found that a bit unseemly. My shirtmaker now makes all my BDs with the second button placed 2.75″ below the collar – that allows for the same look, but it looks more professional and the collar also stands up better (less of an outward curve). Some food for thought. This one is tricky. Personally, I’m not too keen on that jacket regardless of combination. 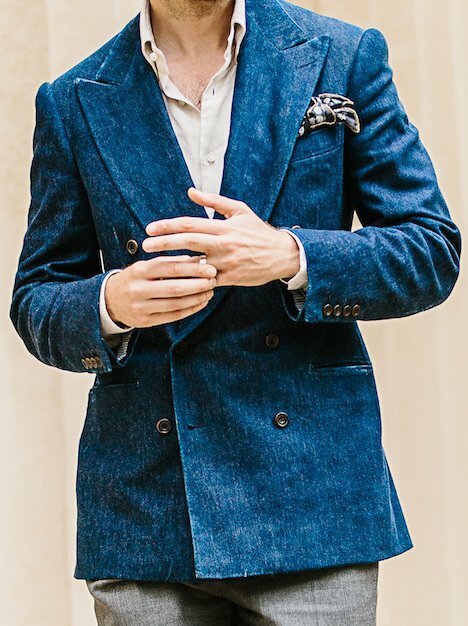 While I love the color of that denim jacket, I find the Cifonelli cut with it’s strong shoulders and roping simply looks off in a getup as casual as this one. I have a shirt in a similar oatmeal color as well and I must admit it doesn’t get much use. I generally go against your original advise and wear it mostly with white/light cream trousers as I find it harmonizes more in that color spectrum. I think one should definitely experiment with sartorial looks. Simon, I like everything except for the sportscoat. Just do not think it works because of the denim fabric. However, the color is nice. I’d love to see the jacket with some knitwear (cream?) and set against light coloured but heavyweight chino and, as Inkster suggests, some suedes or nubucks. In the comments you mention ranges of suitability in shirt colour. I came across a great publication called ‘Colour for Men’ years ago which looked to match differing colour pallettes with differing skin tones (tones not colours…so all ethnicities were covered) . Perhaps too prescriptive now but essentially there were four seasons to skin tone (yellow, blue, rose, clear) and a colour selection to match. Once the science of it was appreciated it made choosing suitable and complimentary colours a lot easier. Interesting, thank you. I went through a process a few years ago with a company called House of Colour that does perhaps a level deeper analysis. I found that a little too deep though. Perhaps I should have put my view on what to wear with the denim. Pink or sky shirt; Oxford or linen, no matter. Creamish trouser; heavy cotton, or dark navy trouser, idem. Espresso or snuff loafer of any description. Whilst crispaire is a summer weight cloth, grey and summer don’t go together. The denim should be more summer than winter, and so needs a summer appropriate colour beneath it. I find this look fascinating on so many levels. It shatters my perception of style boundaries and conventions: the denim jacket is a juxtaposition of ultra-casual fabric with a very formal cut; the trousers are baggier than I would choose and are shorter with deeper cuffs than I would specify. And the loafers are too dandyish for my taste. I love the pocket square though! Some interesting comments here Simon. I always find it fascinating when items are ‘slammed’ by your readership (the RL cardigan was an example). I think on the whole your followers are much more conservative than you are – I also believe you enjoy being a catalyst for discussion and often try to get people to look differently at the way they dress. 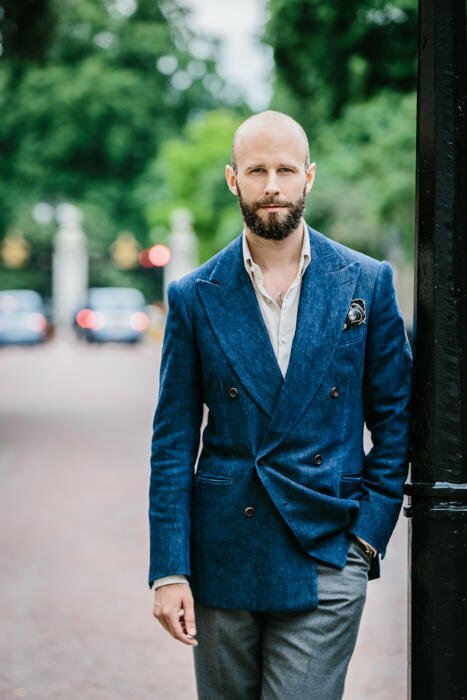 A DB Cifonelli denim blazer is not going to be in the first 10 bespoke items in most PS follower’s wardrobes (and probably not in the first 20), but I admire you for trying it and for welcoming and encouraging the debate. Thanks. And yes you’re right, I always find it interesting to push those points and make sure people aren’t too rule-bound. Fun with the beautiful Cifonelli. The cut is so striking and the shades of denim too (perhaps the effect gets tuned up in photo). Also meaning it will never to me be close to casual. How can it be toned down. Perhaps by wearing it as a suit? Exactly – that’s why I find it doesn’t work with cotton trousers. The suit looks too seventies I think. Hi Simon, love the jacket, it’s something very different. Just wondering since it’s denim, does the colour bleed onto furniture and such? Regards. I have a questiom, so I’m just sticking it here as it is the first comment section that came up. Do you think it is possible for the height of a jacket’s vents to be increased by a decent tailor? I recently picked up a jacket that doesn’t drape very well over the seat, and I think an inch higher on the vents would probably correct this by releasing some more material over the seat/hips. What do you think? It is often possible, but I would hesitate from pre-judging the best alteration to make. In general, it’s better to give more room in the hips by altering the side seam, rather than changing the vents. However, ask the tailor which they think is best. Simon – Love the trousers. Could you outline exactly what I’d need to tell W&S to have them replicate for me? Also what was the price? 2 weeks ago I made the comment re. skin tones and referenced the book ‘Colour for Men’ interestingly I have just looked at Die Workwear! whose latest article covers…dressing for skin tones whilst referencing…’Colour for Men’. Hmm (at least I refererred to Inkster when picking up on his comment). Should ‘Die Workwear!’ therefore reference PS in the article? I still love the site (DW!) but what cheek!